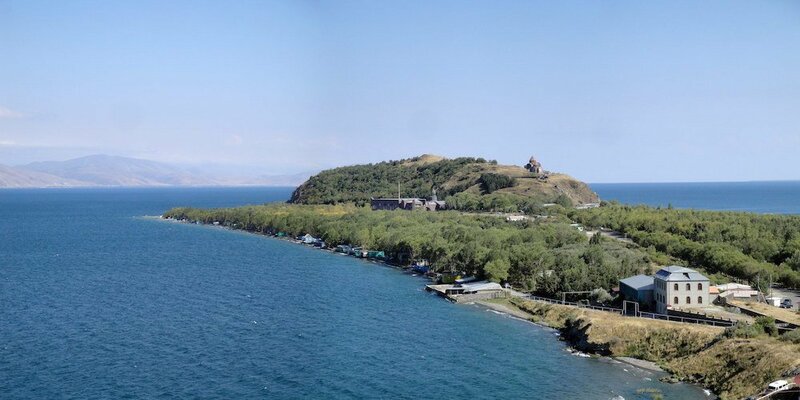 There are a lot of accounts by famous writers of Lake Sevan, in the centre of Armenia. 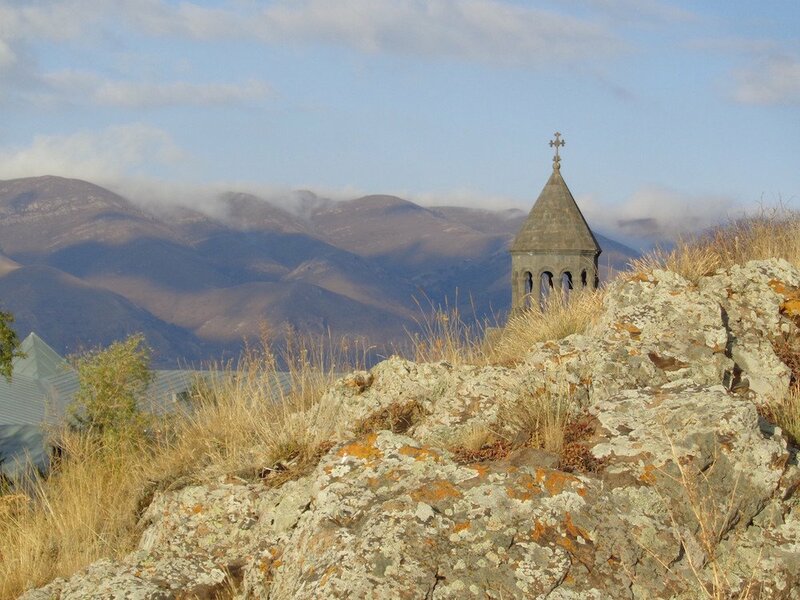 In his 1933 Journey to Armenia, Osip Mandelstam writes of how he “spent a month enjoying the lake water that stood at a height of 2,000 feet above sea level”, and the monastery that overlooked it, “literally paved with the fiery red slabs of nameless graves”. His wife Nadezhda Mandelstam remembered in her memoirs testing new Zeiss camera lenses on the surrounding landscape, whose bright primary colours created a “naïve painting” effect. Three decades later, Vasily Grossman described the landscape as a “rough stone dish, black and blue and the colour of rust”, within which the lake was “deep blue, and almost boundless”. Simone de Beauvoir, who visited with Sartre, wrote in 1972 of “a pinkish, chaotic desert with a bright blue lake in the middle of it”. 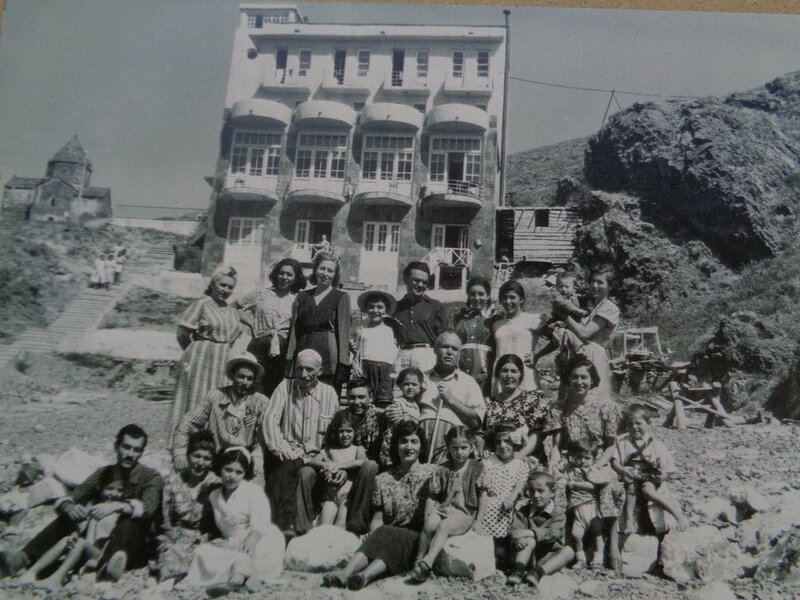 What brought all these authors here was the Sevan Writers’ Resort, built in the early 1930s by the Writers’ Union of the Armenian Soviet Socialist Republic. What none of them wrote about, however, was the story of the building itself (just a “hotel”, for de Beauvoir), a tragic saga encompassing the Soviet avant-garde, Stalinist repressions, the optimism of the Thaw and the slow decline of the post-Soviet years. 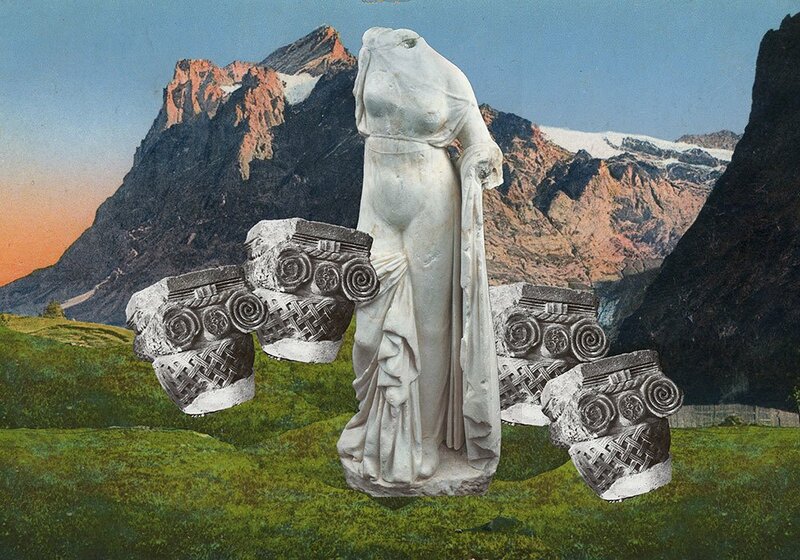 With the Resort currently holding a group exhibition about its own history, and about to face a full restoration, that story might yet become better known. 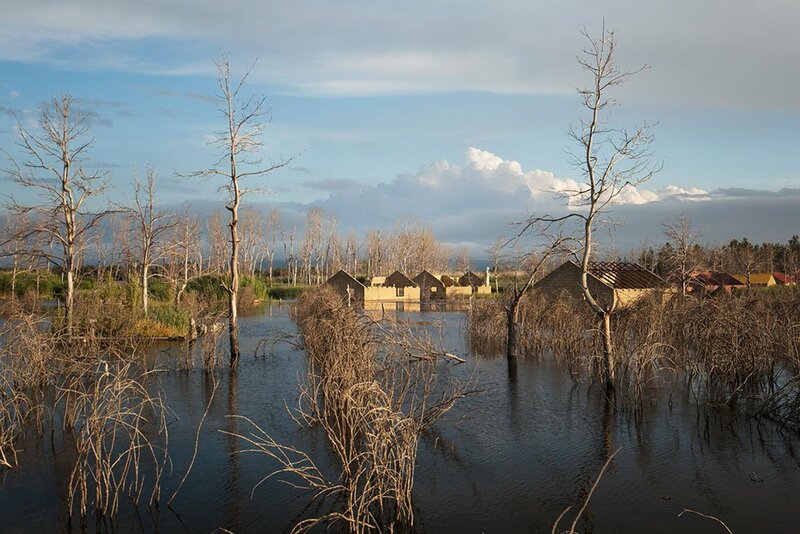 The site where the Writers’ Resort stands was originally an island in the lake, which became a peninsula when the water level was lowered for irrigation works in the 1930s. On the top of the peninsula’s steep hill is a ninth-century monastery, whose conical churches were made from the same harsh red and brown rocks as the landscape around. But the craggy aesthetic of the monastery didn’t influence architects Gevorg Kochar and Mikael Mazmanyan when they were commissioned to design a Writers Resort here in 1932. In the mid-1920s, Kochar and Mazmanyan had been involved with the “left art” group Standard, an Armenian equivalent to communist avant-garde groups like LEF in Moscow and New Generation in Kharkiv. 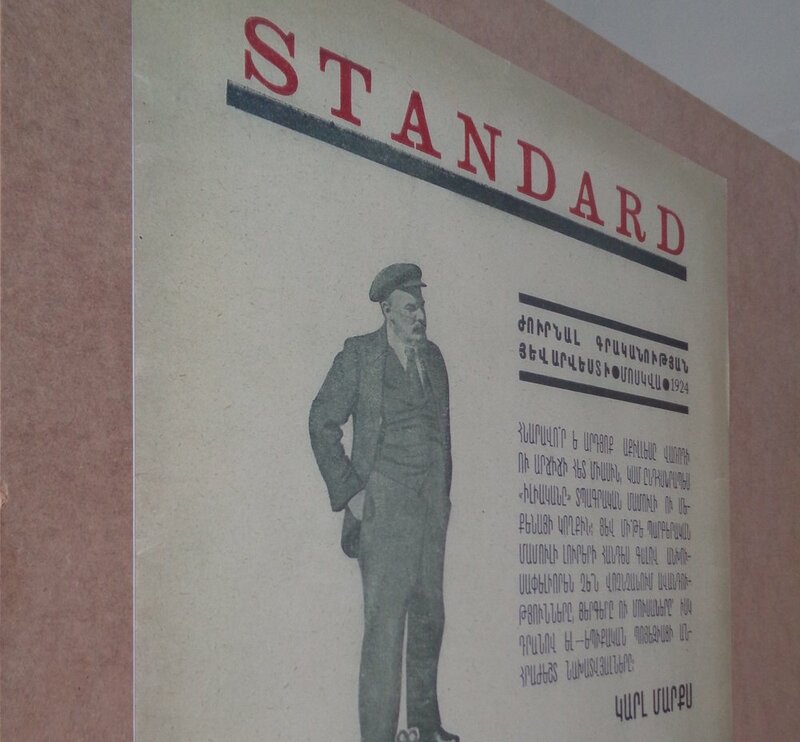 Their ideas were opposed to those who tried to create a “national school” in Armenian Soviet architecture; the image on the first issue of Standard, a montage of Lenin atop some cranks and cogs, gives a good idea of where they were coming from. Subsequently founding the Organisation of Proletarian Architects of Armenia, they argued for ignoring the stylistic elements of historic architecture in favour of engaging with climate and topography. 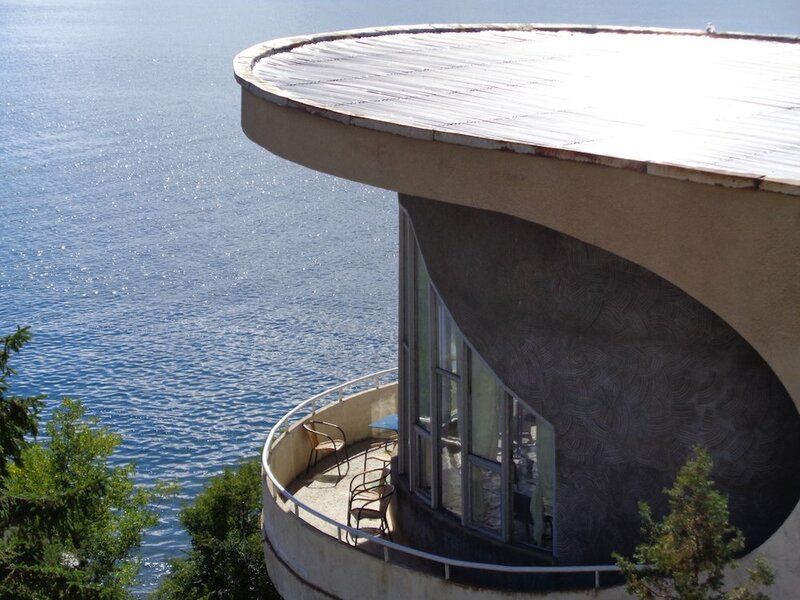 So their Writers’ Resort is laconic, rationalist and calm: four storeys, built into the lower part of the peninsula, with curved balconies and a glazed stair-tower to offer a view over as much of the lake as possible. 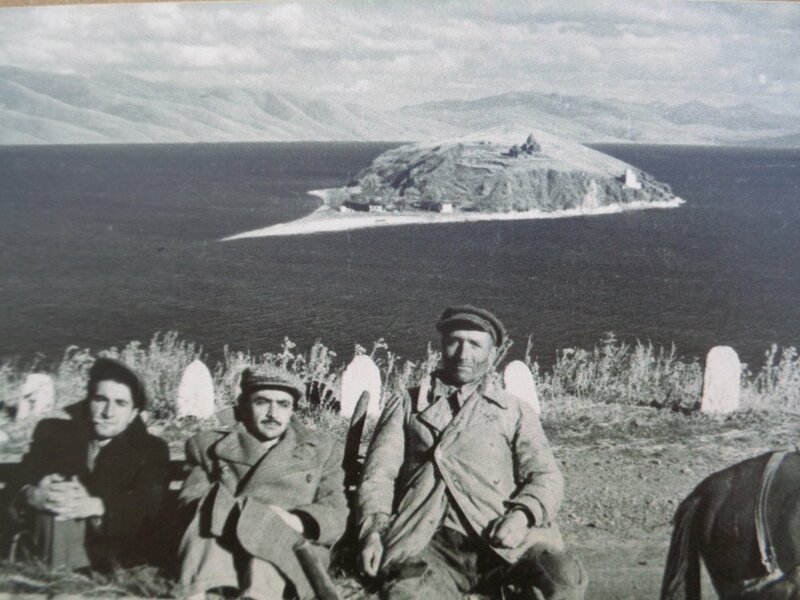 In 1937, not very long after the Resort hosted its first guests, Kochar and Mazmanyan were arrested and deported to the Arctic Circle, about as far from Lake Sevan as it’s possible to imagine. They would spend 15 years in Norilsk before they were “rehabilitated” after the death of Stalin. It’s at this point that the story’s extremely unusual second act begins. 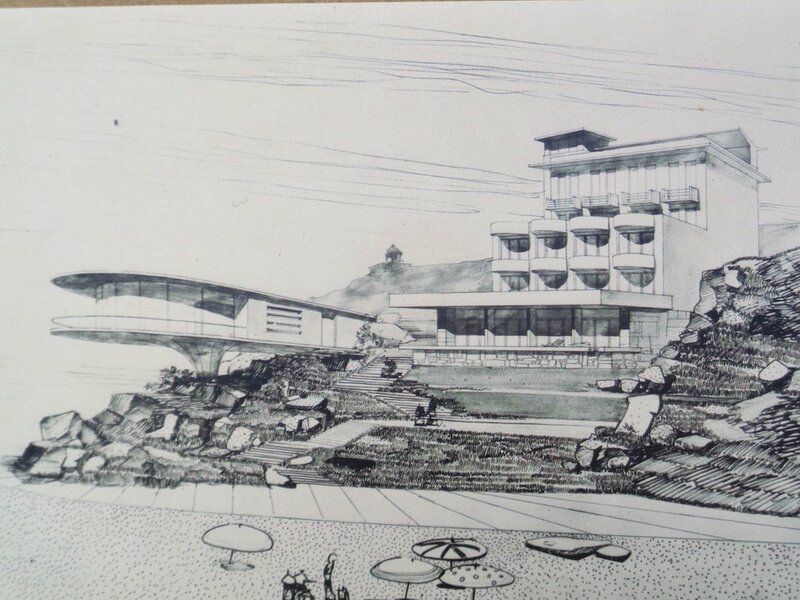 In the early 60s, after his return to Armenia, Kochar was commissioned to design a new café wing for the Resort he’d designed 30 years earlier. The result is astonishing. 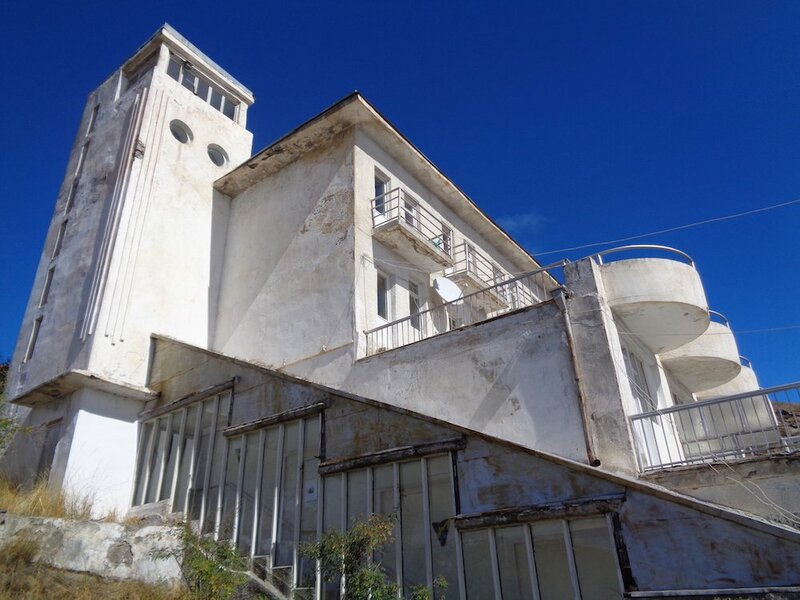 While in the 1920s and 1930s, Soviet avant-garde architects had dreamed of using new technology to create almost weightless, precipitous structures of concrete and glass, what they actually built was the simpler, boxy modernism you can see in the 1932 resort. In 1963, Kochar actually got to build an avant-garde dream project. 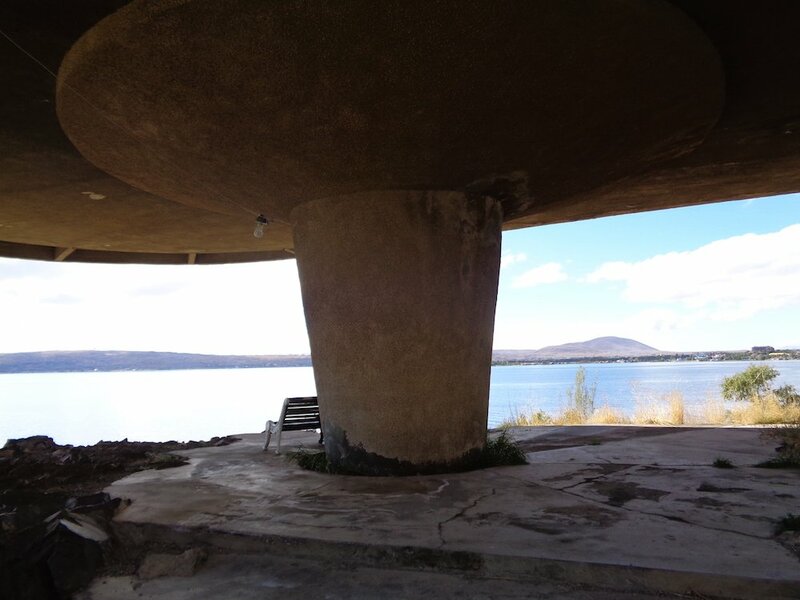 A long, curved glass volume is cantilevered right out above the rocks overlooking the lake, so far that you could park trucks underneath it, with the whole construction balanced on one thick concrete leg. 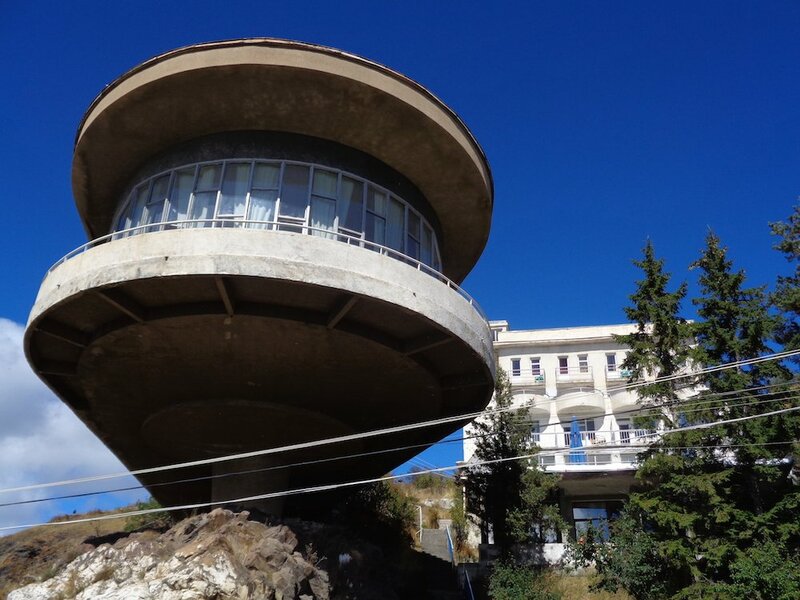 It’s a genuinely spectacular vindication of the ideas about “local” modernism that Kochar and Mazmanyan had advanced in the 20s: completely integrated into its site, a sentry nestled above the rocks, allowing café customers panoramic views of the lake and the mountains. It has no sentimentality towards the monastery or the historic architecture around, preferring instead a futurist aesthetic suited to a country that was then sending people into space. Since the 60s — and especially in the last few years — the building has become an oft-photographed emblem of the modernism of the Khrushchev Thaw, here given particular poignancy because it was the creation of one of Stalin’s victims, coming back to complete the unfinished business of the 1920s. The Writers’ Resort, still owned by the Writers’ Union of Armenia, is dilapidated, now ringed by caravans, huts, some dodgy-looking new hotels and a market in front of the steps leading up to the monastery. But it still takes guests, and the cafe serves trout fished from the lake, described by Simone de Beauvoir as “delicious”, which seemed to me an understatement. 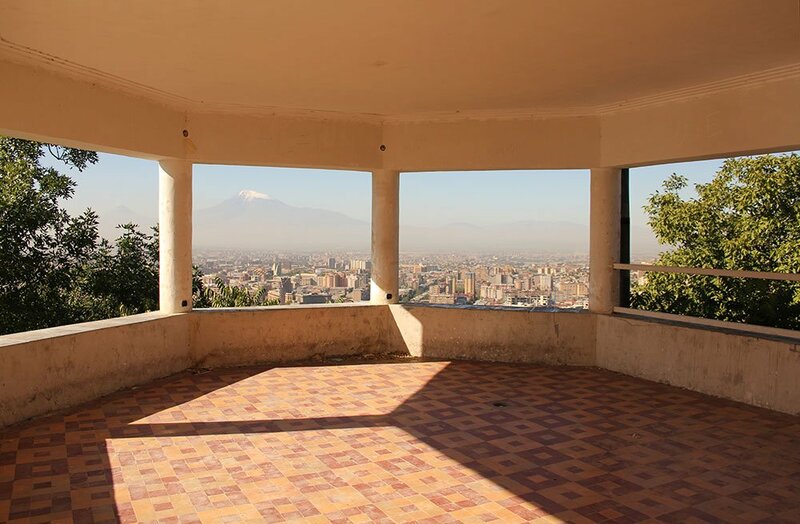 This year, the Resort has an exhibition about itself across its two buildings, part of The Mount Analogue, a series of installations across Armenian towns and cities. The Sevan iteration, Dèja Vu Standart, curated by the architectural historian and writer Ruben Arevshatyan, combines historical exhibits about the Armenian avant-garde with reproductions of issues of Standard, drawings and models of utopian projects from the 1920s, and 1960s family photos and Sartre and de Beauvoir publicity shots. A series of films on modernism, utopia and socialism by the likes of Gerard Byrne and Igor Grubic play in the public spaces of the two buildings. It all does feel like a rare successful Soviet utopian project; the Resort is not luxurious or opulent, but sitting on the curved terraces of the 1932 building, precisely calculated to parallel the sudden swoop of the café, with the red and green of the bushes on the shore, the snow-capped black crags in the near distance and the sun sparkling on the water, this is some sort of vision of paradise. But what now? The surroundings are messy — the landscape could hardly be ruined no matter how hard developers tried, people still holiday here, mainly from within Armenia itself, and the caravans are as oddly fitting as the new hotel buildings are typically post-Soviet gimcrack. But the Resort clearly needs repair and renovation. The current plans are ambitious. A grant as part of the Getty Foundation’s “Keeping it Modern” programme has funded an investigation into the building’s fabric and possible future use by a research team from Yerevan, along with international experts on Soviet Modernism and architects from Helsinki’s Alvar Aalto Foundation; current proposals by Armenian designers Urbanlab envisage this as a pilot project to show what is possible in the renovation of Soviet Modernist buildings, which are habitually either mutilated in clumsy “Euro-renovations” or demolished in favour of approximations of medieval churches. 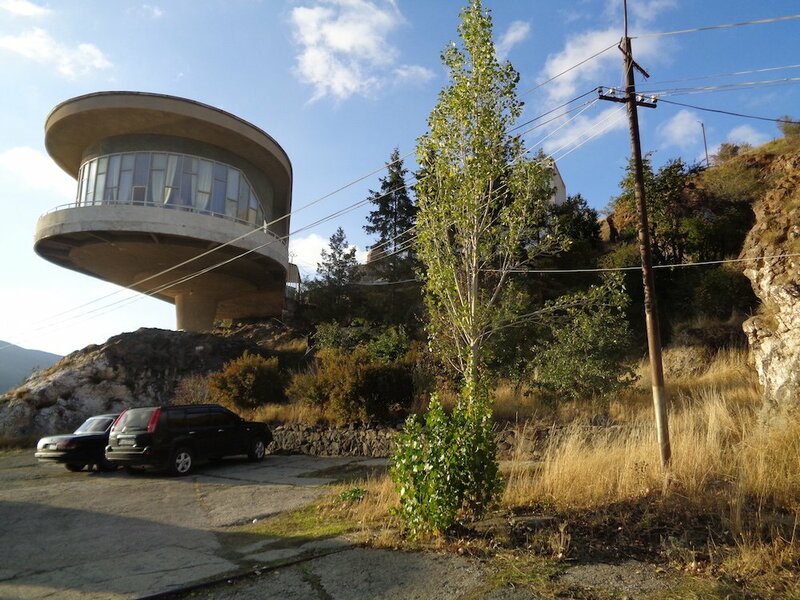 According to architect Sarhat Petrosyan, who reminds me that “Armenia is a very poor country,” the results will need to be “self-sustaining,” so that the renovation can pay for itself and the building not fall once again into neglect and dilapidation. There will be a conference centre and a high-end restaurant; and since this was never intended as a building for everybody, writers will still get a 50 per cent discount. 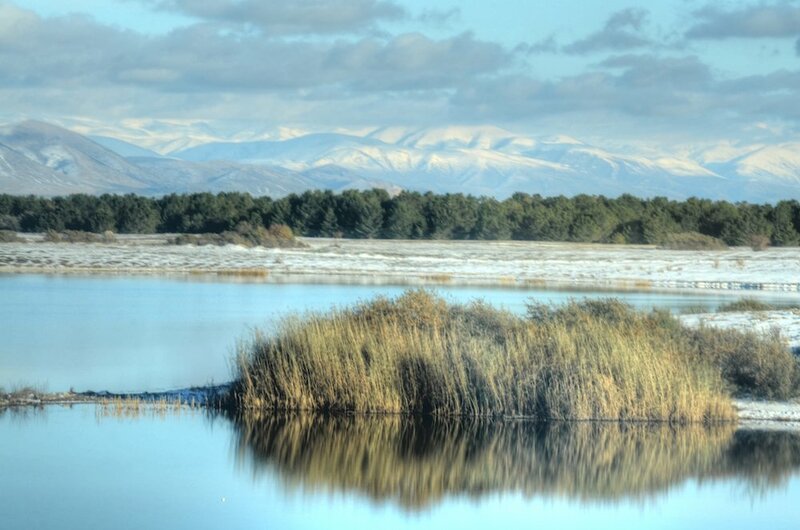 But if you go to Sevan now, before these plans are put in place, you’ll find something entirely unique: a cheap hostel on a mountain lake, a modern art gallery and a living museum of Soviet tragedy and achievement unlike any other. 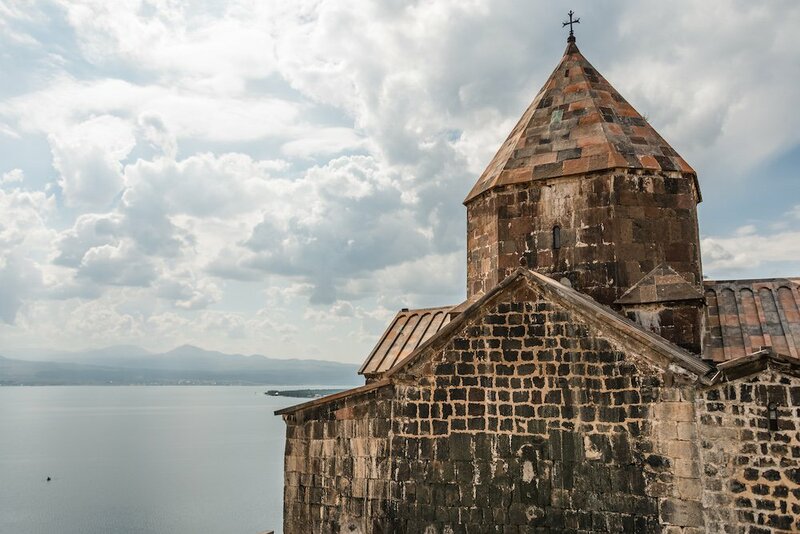 Armenia’s pearl: what secrets lie beneath the mysterious Lake Sevan? Beyond history: how does Armenia’s capital city resolve its Soviet past with its capitalist present?